Properties in Parua Bay average 4.6 out of 5 stars. 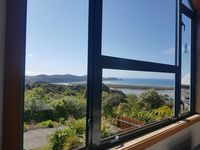 Property 2: Kohinui Holiday Unit, Perfect family retreat. Property 19: Getaway by the sea,fishing, surfing,swimming and a happy safe place to stay. Property 20: Personalised, boutique, beachfront accommodation. Property 24: Only 40 metres to the beach! Property 25: Beside The Sea Exclusive waterfront apartment. Property 28: Relaxed quiet home away from home! Property 30: Paradise in Pataua, beach front bach with it all ! 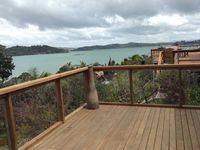 Property 43: Cedar Heights Chalet with Elevated Ocean Views in a Native bush setting. Property 50: Beachfront in quiet idyllic bay. A wonderful modern open plan studio that is equipped with everything you need. Amazing elevated views across Ngunguru and super peaceful environment to relax in. Thoroughly enjoyed our stay at this gorgeous property. All home comforts provided, couldn't have asked for more and Brett and Beth are kind and thoughtful owners.